He’s the son and grandson of civil servants, an Indian Institute of Technology (IIT) alumnus with a graduate degree from a foreign university. The founder and managing director of Premier Cryogenics Ltd and Assam Air Products Pvt. Ltd brushes off any suggestion of altruism for starting a business in a part of the country better known for political unrest and high unemployment than entrepreneurship. The North-East has been a lucrative opportunity, Barooah insists with a practical, no-nonsense air, thanks to public sector oil and gas companies and refineries that need the liquid nitrogen he manufactures and supplies. If anything, he says, “We have taken advantage of the disadvantages of this region." By this, he refers to the remoteness of Assam and its ageing oilfields, the first in the country to begin operations. They began running dry in the mid-1980s, just around the time Barooah returned from studying at the Rochester Institute of Technology and was looking for a business idea. As a chemical engineering graduate from IIT Delhi, he understood why infusing such fields with liquid nitrogen helps trigger crude oil production. And he took note of the fact that the closest source of supply of liquid nitrogen to Assam was thousands of kilometres away in Jamshedpur in West Bengal. The big picture: Abhijit Barooah at his natural gas factory in Guwahati. Barooah’s company supplies liquid nitrogen, medical and high-altitude oxygen, and other industrial gases to sectors from oil to hospitals. So in 1986, a year after India deregulated the industrial gases sector, Barooah pounced. 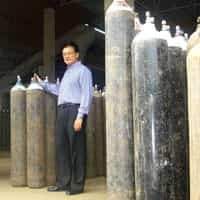 He opened a factory in Sivasagar, a town about 20km from the Oil and Natural Gas Corp. Ltd’s eastern headquarters at Nazira, and signed a Rs15 lakh contract to supply liquid nitrogen to the public sector exploration and production firm. Today, his businesses—Assam Air Products operates in Sivasagar and North Lakhimpur, while a factory in Guwahati under the Premier Cryogenics banner opened in 1996—generate revenues of Rs20 crore; Premier Cryogenics is publicly traded on the Guwahati and Kolkata stock exchanges and regularly pays dividends to investors. But more importantly, to a generation of entrepreneurs looking to cash in on the sudden tide of interest and investment in the region, Barooah represents a native son who has innovated and succeeded, yet still aspires—or rather hungers—to grow and diversify. The trait historically has been associated with outsiders who operate businesses in the region, from the Marwaris, who set up roadside shops in villages, to the Bengalis, who run sweet shops and car dealerships. “He is doing good business, there is no doubt about it, and he has a good attitude towards entrepreneurship," says a high-ranking Assam state government official, who did not want to be named, citing his agency’s policy on offering opinions on a private sector company. “Earlier, there was a perception that business here was only a Marwari’s cup of tea. Guwahati is now developing because of the efforts of many communities. He’s the leading example of that." In an interview at his spacious home in Guwahati—designed by his wife and resembling a Swiss chateau, crossed with a Shillong hillside dwelling—Barooah says he knew very early that he wanted to be his own boss. “Even as a small boy, I wanted to do something on my own," Barooah says. “Somehow I had this intense desire that I would not serve under anybody." Apart from supplying liquid nitrogen, Premier Cryogenics also bottles oxygen for high altitude use by the aviation industry and the Indian Air Force. Nitrogen is also used by food processors and packagers: the puffiness in a bag of chips, for example. More recent contracts have come from the region’s burgeoning health-care industry and hospitals in need of anaesthesia and medical oxygen. One main resource—air—is abundant. Another—power—is not. About Rs25 lakh every month pays the electricity bill, says Premier Cryogenics general manager Tridib Borah. Borah’s resume, in some ways, resembles his boss’ mix of the East and the West. Borah worked for the public sector Oil India Ltd and then won a fellowship to study in Houston, Texas. After that exposure, he says, he was keen to return to Assam, but not the public sector. “Mr Barooah attracted me a lot to come here," Borah says, above the hiss of air being compressed and pushed through tubes, some encased in large chunks of ice formed from the below-freezing—minus 196° Celsius—temperature of the nitrogen within. “He is still sticking to a place such as Guwahati, despite his qualifications." Barooah, 45, prides himself on combining his global exposure (he’s a former Chevening Gurukul scholar in London and takes any chance he can to attend overseas summits and meets, from dissecting chemical compounds to the business climate of the North-East) with acting locally. “When you walk into my factory, each and every person is a local person," says the father of three. “In other companies, 80-90% are from outside." Yet, repeatedly, Barooah begs off being seen as a symbol of anything. “If you compare me to Sunil Mittal," Barooah says, referring to the chairman of Bharti Enterprises, “I am not one-millionth of him. If you are in a place like this, it’s hard to grow," he adds. He pauses in a rare moment of levity: “Am I making a virtue out of my limitations now?" Then serious again: “We will stick to this place though." And so Barooah is expanding his empire and entering new areas—new economy ones that might seem outside the formulaic path of a chemical engineer. He’s bought a franchise of VLCC Institute of Beauty, Health and Management, and training and educational institute NIS Sparta Ltd, a division of the Reliance-Anil Dhirubhai Ambani Group. He foresees a big business opportunity in training and education as the region’s youth try to catch a piece of India’s economic boom. Assam’s unemployment rate among educated urbanites tops 14%, nearly double the comparable figure for the rest of India. And yet, Barooah sees anecdotal evidence of improvement, particularly when he is recruiting. “Today, like any other city in India, it is hard to find and retain good people," Barooah says. “Five years back, all the engineers were unemployed. Now they are employed. That has been a big change in this economy." His propensity to look on the bright side makes the other hats he wears logical. Barooah is chairman of the Assam Financial Corp., the industrial loan agency founded by the governments of Assam, Manipur, Tripura and Meghalaya, and spearheaded an effort to bring back the organization back from “the deathbed", he says. His strategy, he says, was to infuse the agency with professionalism, encouraging its staff to run it as a business, not as a part of a government. Barooah also chairs the state council of industry body Confederation of Indian Industry, which recently focused on the North-East during its “India@60" anniversary celebration in New York. In December, another conference is planned for non-resident Assamese to discuss investment in the state. There are some ironies of being a son of the soil. Barooah’s first loan to fund the factory was made possible by the Assam Industrial Development Corp. Ltd. Now, Barooah sits on its board. Paradoxically, he says, it was easier for the government to take a chance on small businesses back then. “In drafting an industrial policy for the state, we must suggest how to cut down on paperwork," he says. “The intent is there, but implementation is where the problem is." He encourages fellow entrepreneurs and investors in the North-East to rid themselves of a defeatist mindset. “Yes, there are problems here—floods, bandhs, militancy," Barooah says, “but there are problems everywhere."